A masterpiece of Prairie School landscape architecture. Originally built in 1889 for raising tropical water lilies, the Lily Pool was redesigned in the prairie style during the 1930’s by Alfred Caldwell. The landscape design of the Caldwell Lily Pool is a tribute to the natural ecology of the Midwest. It was originally designed to mimic a river formed by a melting glacier’s flow of water cutting through limestone. The stonework and paths have a natural look that conveys the interpretation that melted glacial water flows are cutting through moraines, creating dramatic limestone bluffs. A waterfall near the north end of the lily pool represents the source of this glacial river. 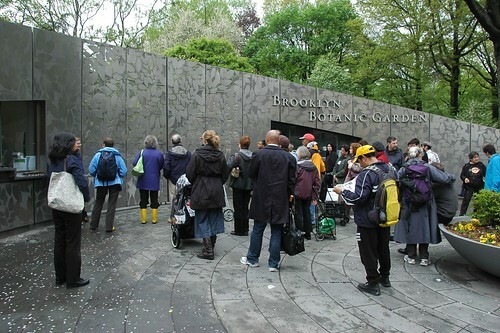 After decades of disrepair and neglect, this site was rehabilitated and refurbished in 2001 and 2002 and reopened to the public. It's going to take me several days to slog through the 350 photos I shot today, let alone what's coming tomorrow. Suffice to say that I was overwhelmed and inspired by what I saw. Here's the outline for my entire Chicago trip. I'll be adding the links as I write the posts for each feature of the tours. This is a 180-degree panoramic shot stitched together from eight hand-held and panned shots using the pano tool built into Microsoft Vista. Best viewed at the largest resolution your monitor can support. I took this shot while standing on the Nichols Bridgeway, just opened two weeks ago, which joins Millennium Park to the new modern wing of the Art Institute of Chicago. Monroe Street passes underneath, on the left and right of the photo. Downtown Chicago is to the left, and Lake Michigan is to the right. Millenium Park, including the Great Lawn and Lurie Garden, are roughly in the center of the photo. I created this panorama of the Native Plant Garden at the Chicago Botanic Garden the same way. 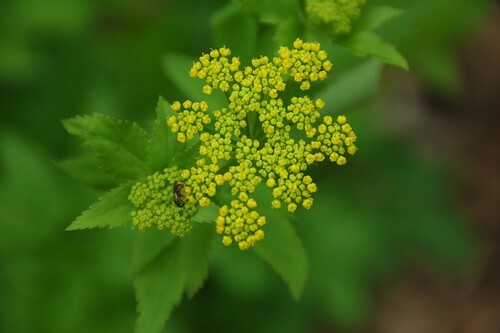 John Jordan, Natural Resources Supervisor at Prospect Park Alliance has found evidence of the beetle there, and says that there was a confirmed report on North Brother Island (between Manhattan and Queens) last year. VLBs are suspected to be in some of the larger parks in the Bronx, northern Manhattan and northern Queens. 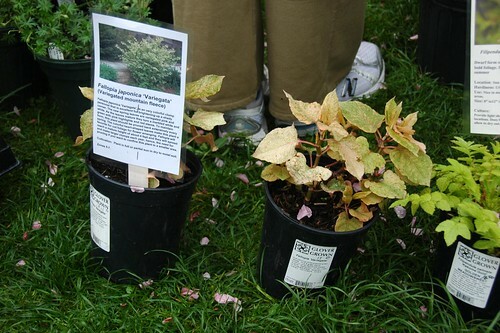 Unfortunately, my recently transplanted Viburnum dentatum is one of the highly susceptible species. When I left yesterday morning to attend Chicago Spring Fling, it was still in spectacular bloom, covered with white flowers. I would hate to lose it; it's the largest plant I have, except for the cherry tree. I haven't noticed any feeding damage, but I will examine it closely when I return, now that I know what to look for. 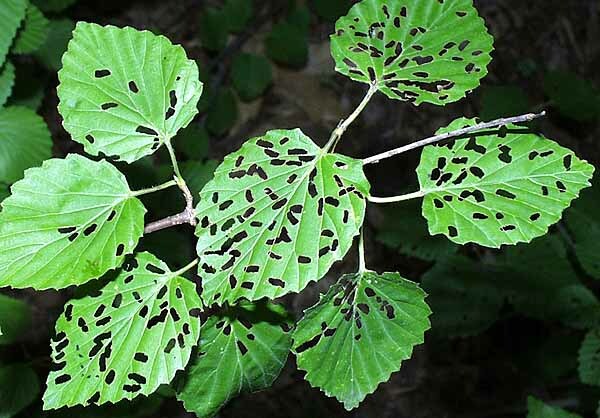 The viburnum leaf beetle, Pyrrhalta viburni (Paykull), is an invasive, non-native beetle that first appeared in New York along Lake Ontario in 1996, and has steadily spread. It is a voracious eater that can defoliate viburnum shrubs entirely. 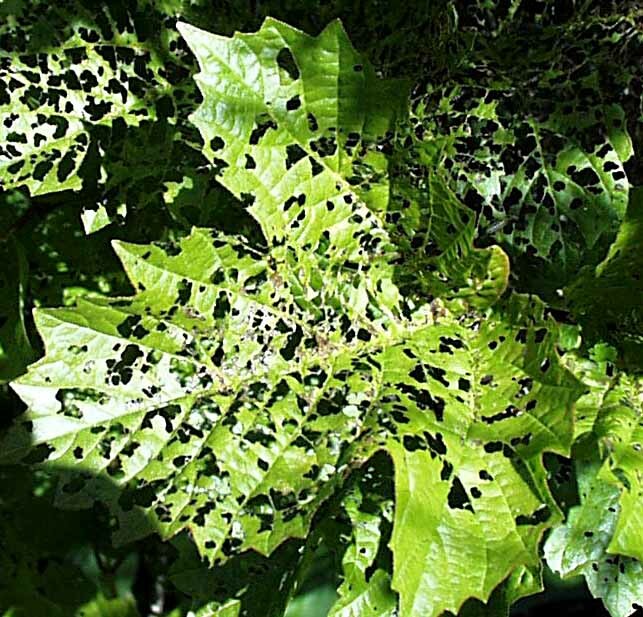 Plants may die after two or three years of heavy infestation. Sometime this week, one of the counters I use to keep track of visitors to this blog will reach 100,000. I began tracking visits in August 2006, just three months after I launched this blog in May 2006. Each tracking service counts things differently, and the counters I have disagree on how many visitors I've had. While the lead counter says I've had 99,859 visitors at this writing, another reports only 90,318, a discrepancy of 10%. For this and other reasons, I don't use these counters for exact tracking, but for trends and general patterns. For those purposes, they're accurate enough; using trackers from different sources balances the systematic counting errors any single algorithm would incur. So, regardless of whether it's 90,000, or 100,000, or some other number, I am grateful for all the visitors I've had over the years. My goal has never been to manage my "hit count." If it hasn't been obvious, this is a personal blog. I strive to avoid (or at least minimize) self-indulgence, and make my posts timely, relevant, and informative. But it will always be with my own voice. I own my words. I recognize that's not to everyone's taste. For those of you who do visit here, welcome, and thanks. 2012-05-21: Updated - again - the links which WNYC broke - again. 2011-08-23: Updated to current links from the old ones which WNYC voided. Domestic Bliss: Blog Widow (left) and me in the gardener's nook on the occasion of the interview. I had just transplanted the female Ilex verticillata in the background that morning. Two weekends ago, Blog Widow and I were interviewed by WNYC's Kathleen Horan on the topic of marriage equality - marriage for all - in New York state. The piece aired this morning, and is available on the WNYC News Blog. We make our appearance about 4:55 into the segment. I didn't get to listen to it when it aired at 7:50am this morning. I thought it might be off-topic for the blog. 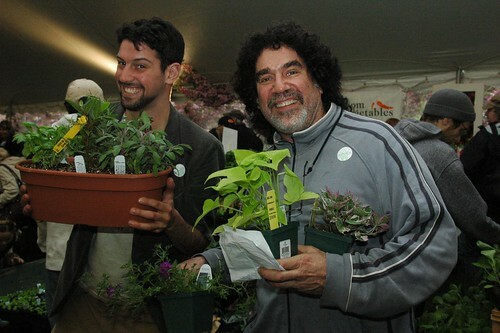 But since most of my part of the aired conversation is about the garden, I figure it it's not much of a stretch. Please give it a listen, and let me know what you think in the comments below. 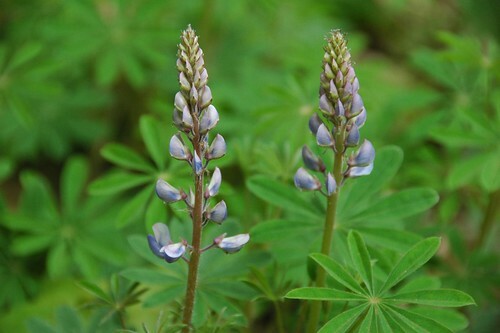 In observance of Endangered Species Day, here is a list of just some of the plants listed as endangered in New York state. 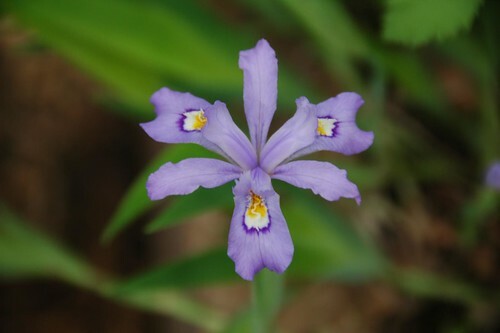 Note that plants endangered in one state may not be listed in another. 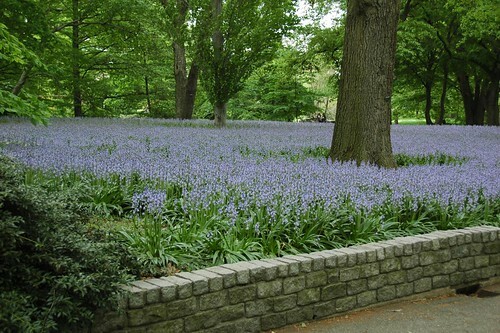 See also The Osborne Garden and The Bluebell Wood. 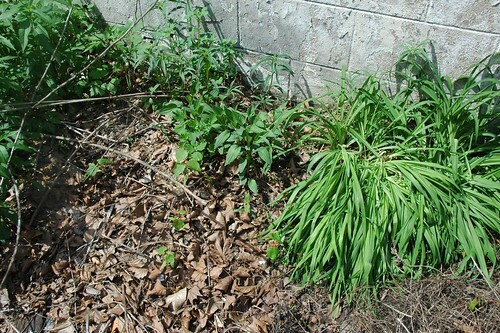 For the past four years I've been cultivating my backyard native plant garden. I've been adding compost and mulching with leaves and shredded Christmas trees, as much as I can get of all of it. I'm not yet able to grow The Precious (below), but I'm learning in Soil Management class that what I've been doing is just what's needed to develop the humusy, woodland soil it requires. 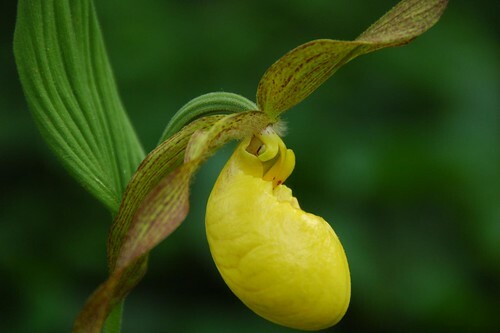 Someday, I'll have some in my garden (obtained, of course, only from a conservation-oriented source such as the Vermont Ladyslipper Company). Meanwhile I can enjoy them in BBG's Native Flora Garden. I find the native Lady-Slipper orchids achingly beautiful. They seem more to float than to be held up by their slender stems. Maybe they would seem less fantastic if they were more common, spreading like dandelions, and less specialized in their environmental requirements. Maybe, but not by much. There are other beauties in bloom right now. The early Spring wildflowers have been replaced by the regime of those which bloom in late Spring, and even early Summer. 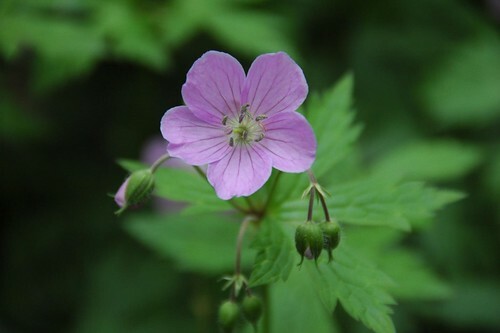 Geranium maculatum is one example of something I associate more with Summer than Spring. It is, in some settings I've seen, a common wildflower. But I covet it for my own garden nonetheless. Some of the Spring ephemerals are already entering senescence. 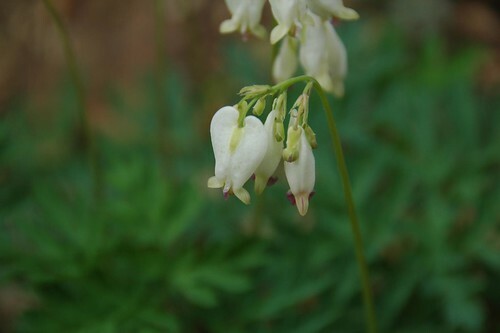 Here's Dicentra cucullaria Dutchman's Breeches, as it appeared Tuesday afternoon in one part of the Garden. Contrast that with how it appeared just three weeks ago in a different location. Spring ephemeral describes a life habit of perennial woodland wildflowers which develop aerial parts (i.e. 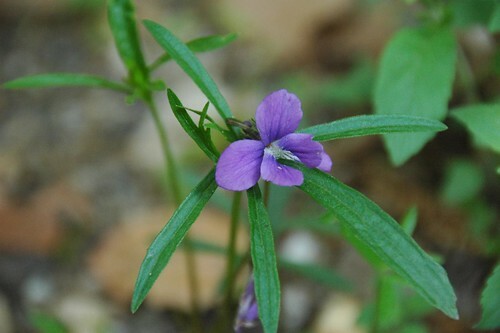 stems, leaves, and flowers) of the plant early each spring and then quickly bloom, go to seed and then quickly die back to its underground parts (i.e. roots, rhizomes, and bulbs) for the remainder of the year. 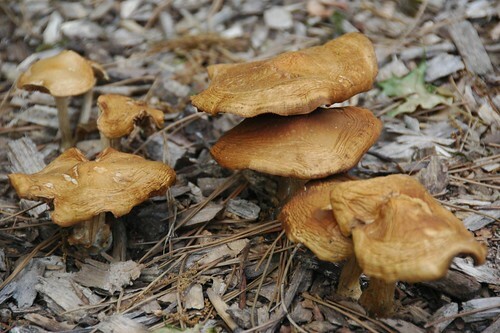 This strategy is very common in herbaceous communities of deciduous forests as it allows small herbaceous plants to take advantage of the high amount of sunlight reaching the forest floor prior to the leaf-out of woody plants. 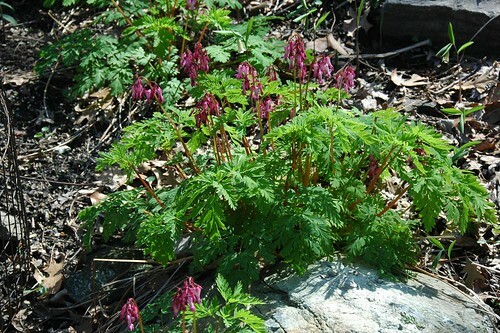 It's interesting that Wikipedia lists Dicentra eximia among the Spring ephemerals. It's still going strong at BBG. 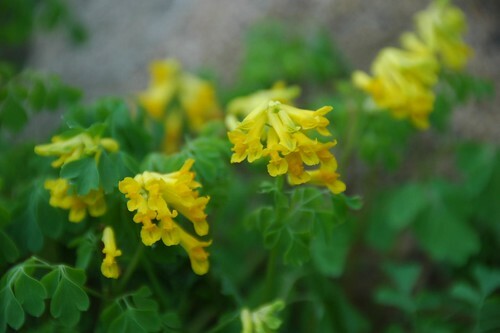 My experience is that it blooms for months, and lasts at least through the summer, barring drought. This is one of the things that makes it an excellent performer in the garden. 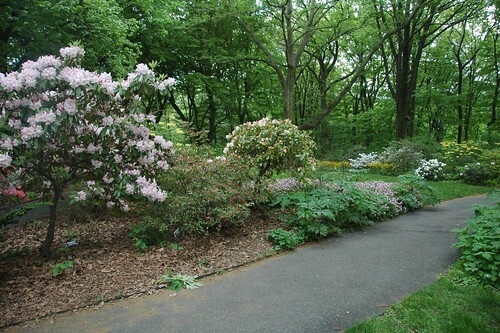 The march of the Rhododendron in the Osborne Garden continues into the Native Flora Garden, more evidence that early Summer is replacing late Spring. Two purple beauties from the Pine Barrens habitat, something which I would only be able to recreate in container in my garden. 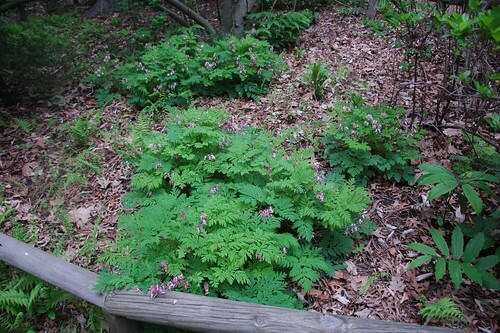 See also The Native Flora Garden and The Bluebell Wood. 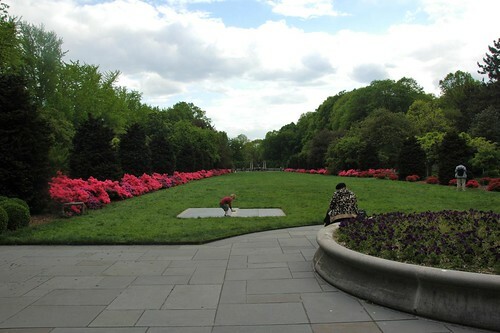 The Osborne Garden of the Brooklyn Botanic Garden, with the Brooklyn Museum as a backdrop, yesterday afternoon. 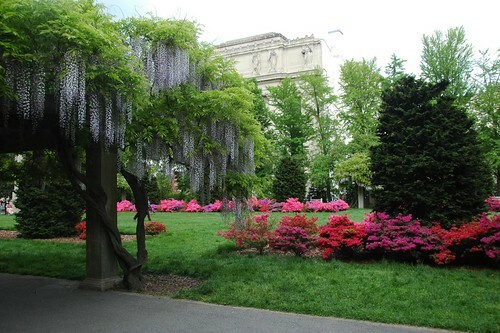 As befits a formal garden, the plant palette of the Osborne Garden - the grand entrance to the Brooklyn Botanic Garden from Eastern Parkway - is somewhat restricted. 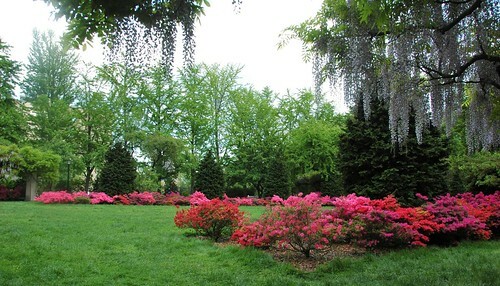 The main body of the design is a large rectangular lawn, flanked by symmetrical ranks of azaleas, crabapples, and Wisteria arbors. But who's complaining. The symmetry is obvious as one enters the garden from Eastern Parkway. But that symmetry is deceptive. There are decidedly different experiences of entering into the garden when one goes to the left or, as I prefer, to the right. There's a progressive sense of enclosure, in part because of the rock wall and the rise of Mount Prospect Park. And the light is decidedly different, more sheltered and shadowed, on the right-hand, western path. 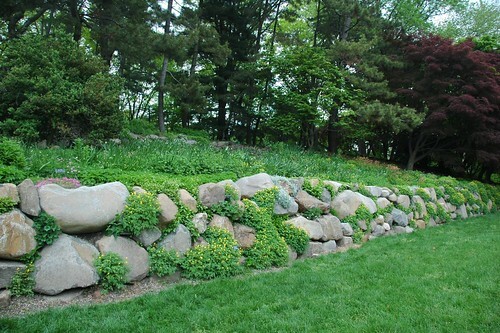 With its rock wall and bedding displays, the western path also offers more horticultural variety. And best of all, it leads to the shade garden. 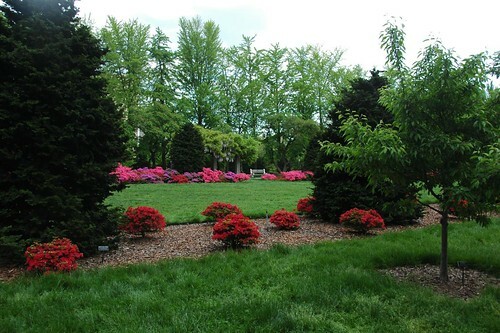 The azaleas of the Osborne Garden hint at the explosion of Rhododendron in bloom throughout the Garden right now. And just to the left of that border is the secondary entrance to the Native Flora Garden, of which I'll have photos tomorrow. 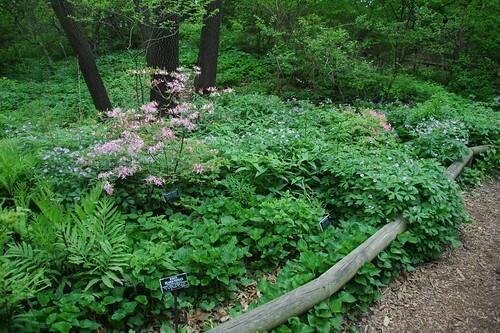 See also The Native Flora Garden and The Osborne Garden. 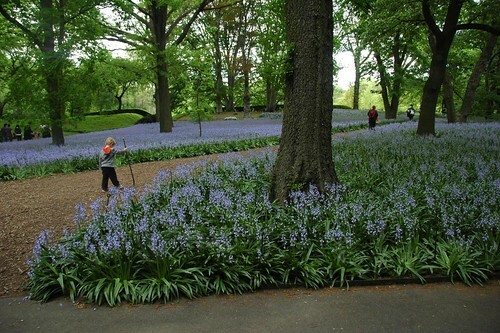 The Bluebell Wood at the Brooklyn Botanic Garden is at its peak. See it this week, or wait another year. 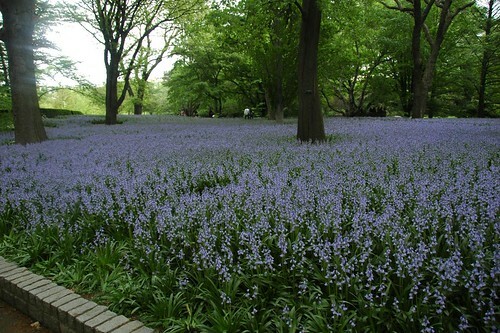 The Bluebell Wood is one of those big, cymbal-crashing displays for which only large gardens can afford space. Like Daffodil Hill, this really only looks good at one moment of one season. The rest of the year, at best, it creates the negative space to appreciate the trees - oaks, here - and the views through to the other gardens beyond. At its worst, it's an eyesore, when the foliage is bedraggled and brown, and the Wood is just something you walk through, preferably quickly. But for now, the Bluebell Wood is having its moment, and it's a glorious one. Last week was NYC Wildflower Week. Appropriately, here are some wildflowers blooming over the past week in my backyard native plant garden. Wildflowers blooming near the gardener's nook in my backyard for last May's Garden Blogging Bloom Day. Somehow, I have no photos of this from my garden in Flickr. Yet it's been a favorite of mine for decades. Native range is eastern North America. Widespread in New York state. Native to all five boroughs of NYC. 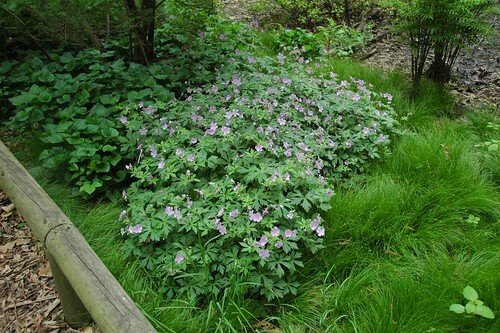 A great groundcover for partial shade. Several cultivars are available. To my eye, all vary only slightly from the species, though I haven't grown them side-by-side. Individual flowers look like shaggy sunflowers. Native range is Mid-Atlantic and Southeastern United States. Native to only one New York upstate county. Not native to NYC. 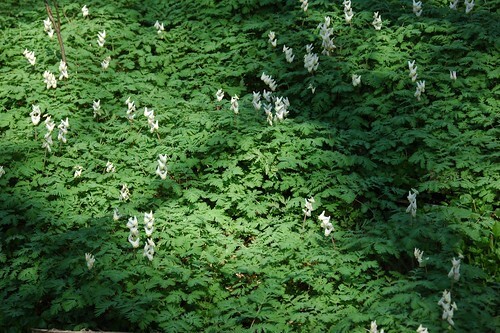 A white-flowering cultivar of the native Eastern Bleeding Heart. Not every white-flowering form of a plant is successful. This is one that is equally lovely as the species, bringing its own graces to the structure of the inflorescence and individual flowers. 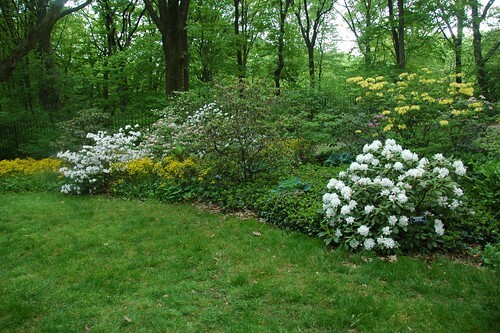 Also a good choice for the shady white garden. This plant is maybe three years old now. Not only has the original plant spread in size each year, this Spring I've noticed little seedlings cropping up around the mother plant. I'll be curious to see how these develop, and what the flower color wil be in the children. Really beautiful, if a bit of a finicky grower. It seems to be at its best when grown on a slight slope with ample mulch. The stems trail through the mulch, the fans oriented down-slope. Sulks during the summer. Needs consistent moisture during the hot summer months and good drainage during the winter or it will disappear. Where it's happy, it makes a great groundcover. 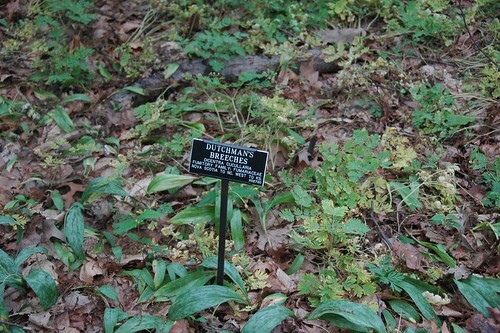 Native to Mid-Atlantic and interior Eastern United States, but not New York. 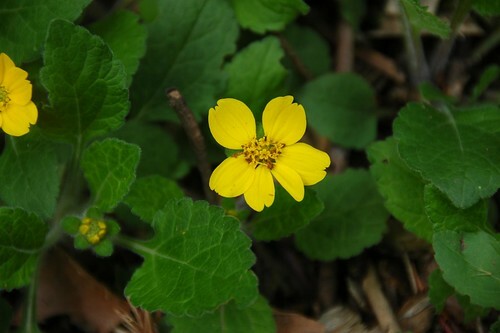 One of the best wildflower ground covers you can grow in the garden. 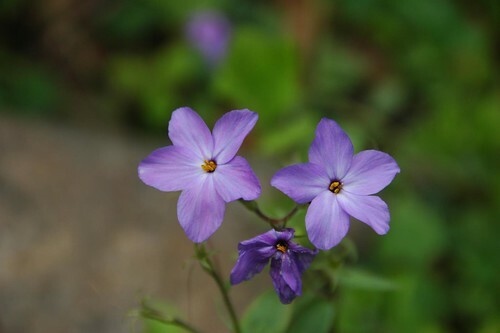 In the trade, you're more likely to find cultivars selected for flower color - such as 'Bruce's White' and 'Sherwood Purple' - rather than the unqualified species. They all seem equally fine to me. 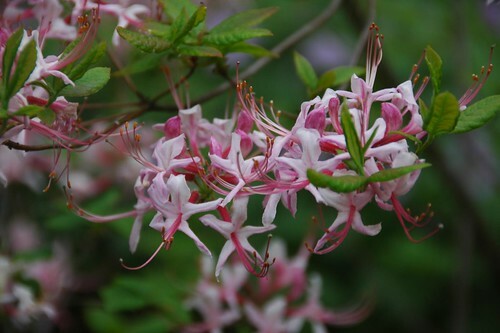 (Mine is also a cultivar, but its name escapes me at the moment.) 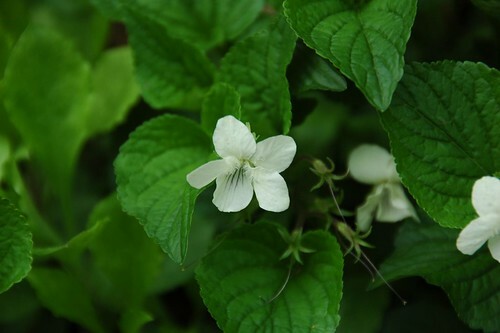 The flowers are usually fragrant, reminiscent of grape jelly. Native range is most of Eastern United States, but only found in two upstate New York counties, not NYC. The "oldest" plant in this post, this population came from my second city garden on 5th Street in Park Slope. The original plants were given to me 8-10 years ago by a gay couple who lived across the street. 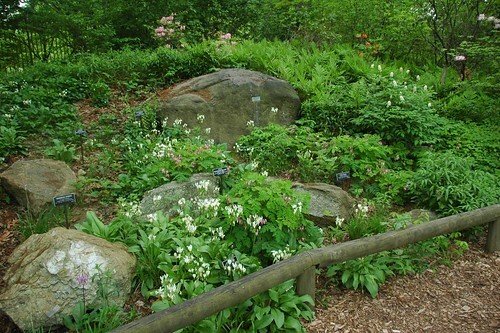 They have a beautiful shady backyard garden growing many wildflowers collected from their home in upstate New York. Native to Eastern North America. Native to several counties in New York, but not NYC. This plant is a recent discovery for me. I had never heard of it before picking it up from Gowanus Nursery last Spring. 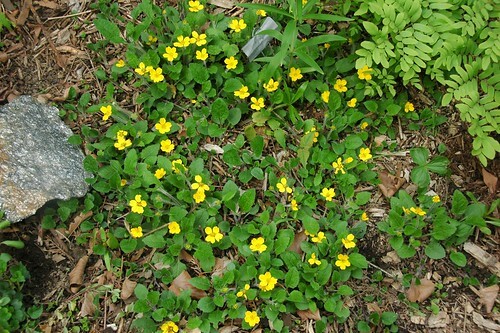 Now I see it all over the place, and it's a fine groundcover. You can't see it in this photo, but the foliage is also handsome. Native to NYC, but not Brooklyn. 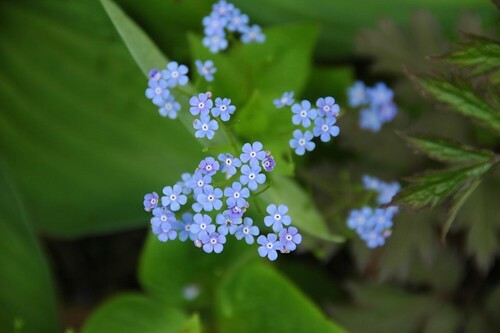 Okay, Brunnera is not a native wildflower on this continent - it's native range is Eastern Europe - but it is blooming in the backyard and it's so pretty I had to take a picture of it. 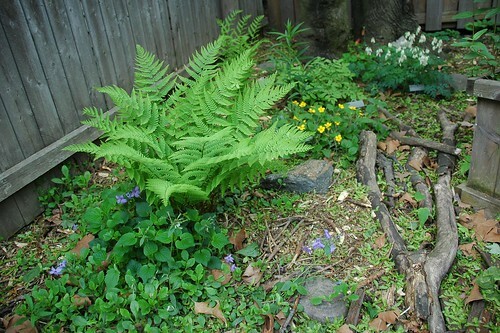 This plant is a refugee from the sideyard of Frank, a neighbor, professional gardener and fellow garden blogger at New York City Garden. 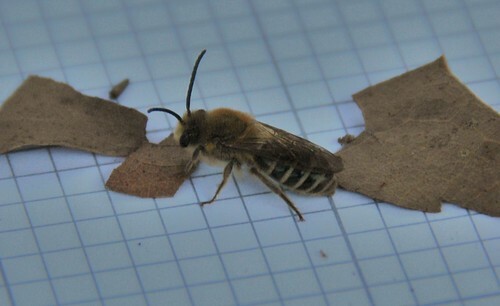 I'm no entomologist, but I think this is the same species, Colletes thoracicus (Colletidae), Cellophane Bees, that "bee guy" John Ascher identified from my photos last year. This is an individual from a colony that appeared this week in the same place it appeared last year about this time. We've had rain almost every day for a week. Yesterday I had the day off, and the weather also took a break, with sunny skies and temperatures in the 70s (F). Seems like perfect digging-in-the-ground conditions to me. The area of activity is much larger this year than last. I wish I had a video camera. In the area of this photo, there were at least 30-40 bees flying around, but I can't pick them out from the photo at this scale and resolution. 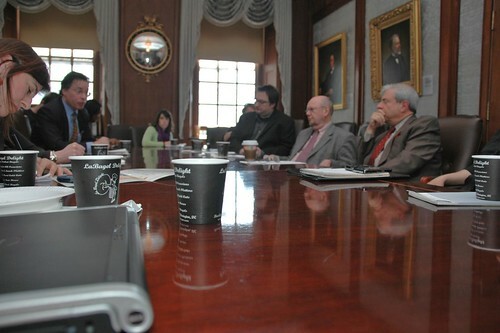 A meeting of online journalists, professional, citizen, and otherwise, with Brooklyn Borough President Marty Markowitz a few weeks ago. Looking forward to seeing my fellow citizen journalists at the Brooklyn Blogfest this evening. As a newspaper reporter who spent a few years covering a town much like Baltimore [the setting for The Wire] — Oakland, California — I often found that bloggers were the only other writers in the room at certain city council committee meetings and at certain community events. They tended to be the sort of persistently-involved residents newspapermen often refer to as "gadflies" — deeply, obsessively concerned about issues large and infinitesimal in the communities where they lived. 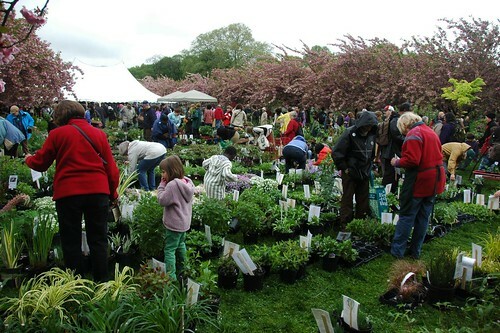 This afternoon I attended the Members-Only Preview of the Brooklyn Botanic Garden's 2009 Plant Sale. The sale opens to the general public all day tomorrow, Wednesday, from 9am to 7pm, and continues Thursday morning, from 9am to 12noon. I haven't been able to go for the past few years. I forgot how much fun it can be. It gets crowded at times, but it's the most pleasant crowd to be in. 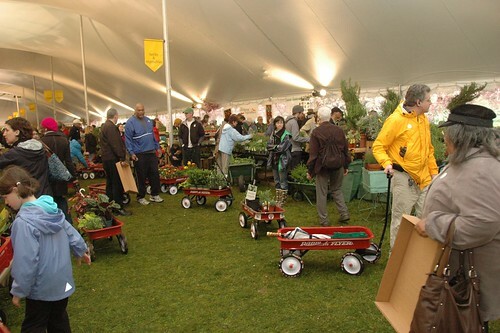 Everyone is smiling, checking out each other's little red wagons full of plants, offering advice and tips. The only potential meltdown I observed involved a young girl bringing an orchid to her mother, proudly sharing that this was the prettiest flower she could find. The orchid was not going into the wagon, and I moved on before things got ugly. 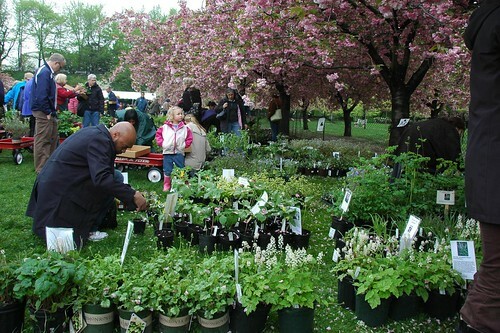 The two Trilliums are destined for the backyard native plant garden, of course. I've coveted a Fargesia for several years. I had one in the first garden, in the East Village. The genus was then known as Sinarundinaria; by any other name, still a lovely addition to a partially shaded location. 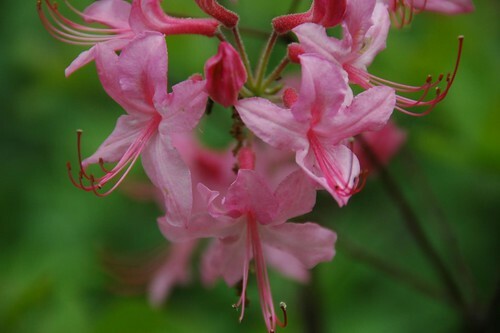 This one, I think, will replace the Viburnum at the shady front of the house. The other three will go along the shady path on the north side of the house. There will be photographs of these in situ once they're planted. 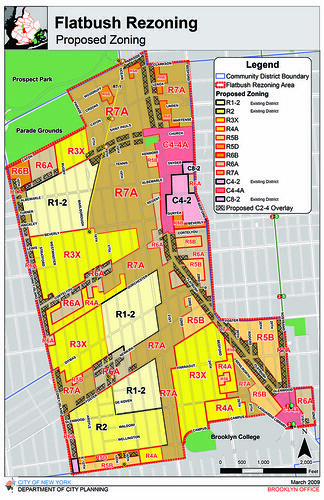 Brooklyn's Community Board 14 approved the Flatbush Rezoning Proposal without modification. The next step is review by the Borough President's office. The public hearing is this Thursday, 5/7, at 5pm at Borough Hall, 209 Joralemon Street (back entrance), in the Courtroom. The Flatbush Rezoning Proposal is unusual in several ways, not least of which is the degree to which the Brooklyn office of City Planning worked with Community Board 14 to develop and revise the plan. The proposal is intricate in its detail and deviates from defacto standard DCP practices in order to meet community concerns. It's therefore critical that those who support the plan turn out in force to ensure that the collective voice of our communities carries the proposal forward. There are three rezoning proposals on the agenda Thursday evening: Greenpoint-Williamsburg, Flatbush, and DUMBO. It's going to be a busy night, and it conflicts with the Brooklyn Blogfest, which starts at 7pm the same evening. It's a short ride on the B25 bus from Borough Hall to powerHouse Arena, the site of the Blogfest, so I hope to make both events on time.